It seemed like the right time of year to share one of my family’s favorite recipes. Sure, I’ll talk a little about how this soup is appropriate for vegans, or those who can’t have dairy in their diet or don’t want to for health reasons, but I hesitate to limit it in that way. This is just a darn good soup. It’s delicious whether or not you care about cream in your food. But for those mentioned above looking for a bit of warm, thick, comfort soup, this might just hit the spot. It’s nice to know that cream is not necessary to obtain the delicious creaminess associated with so many favorite soups and other foods. Kevin and I both get stomach aches after consuming milk, and I tend to eat very little dairy products regardless. Often in these instances, the food processor is our best friend. 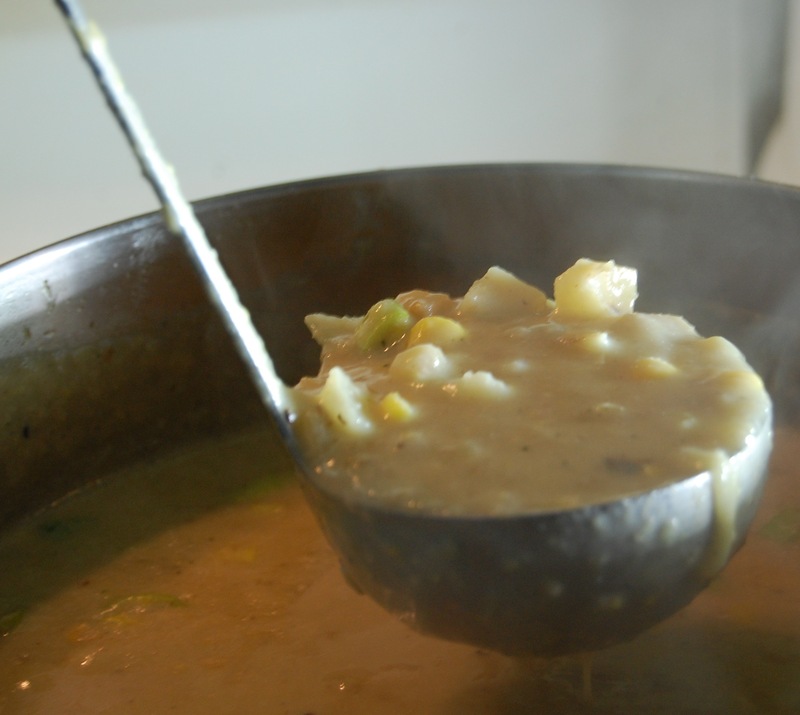 It magically transforms corn to creamy corn chowder, or cashews into ice-cream. It’s the most used appliances in my house, especially since I got the Braun one that can handle liquid blending, too. By some tragic oversight in the corporate world, my Braun has been discontinued, so I pray for it to last at least as long as my previous one, a full twenty years. No planned obsolescence there! Nuts can also be useful in adding a bit of creaminess to soup. Some people grind theirs in the food processor, but I like to be extra careful to break down all the little tiny pieces to allow for a smoother cream. So, I use the coffee grinder to grind down the cashews first. The finer you can make the particles, the better they will turn to delicious cream. Nutritional yeast can be found in the bulk section of Whole Foods & other natural food stores and helps with the fermented flavor we associate with cheese-like products. It’s also high in B vitamins, and good for vegetarians. 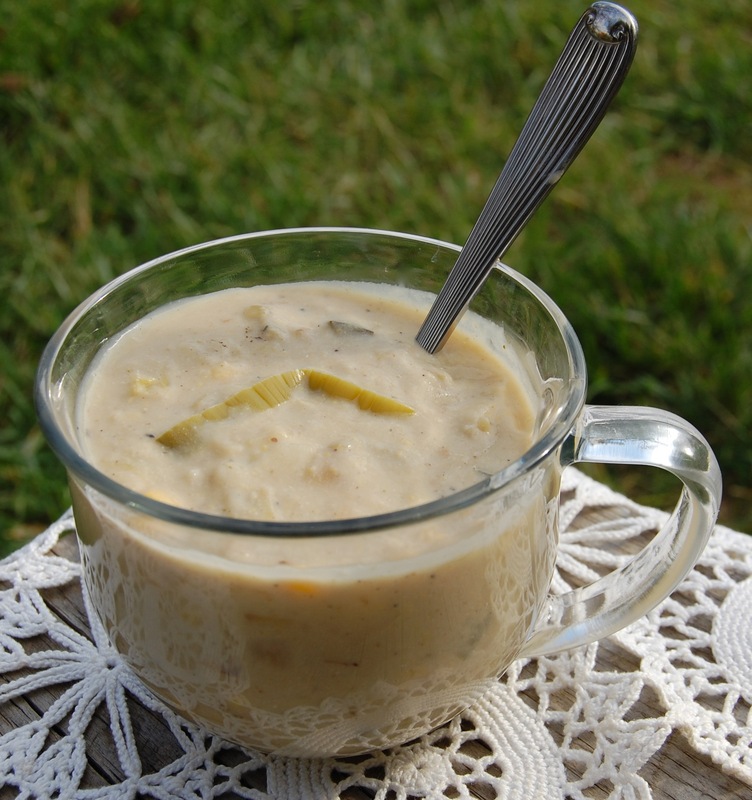 For those who prefer a milder potato leek soup, you can certainly leave the chile or jalapenos out. And don’t be limited to my vegetables. Once you’re familiar with the creamy potato base, you can play around with a huge variety of vegetables to go into your soup. I’d like to explain a few things about the chile. Now, I don’t usually associate leeks with spicy, but here’s the thing: Kevin loves leeks in potato soup. 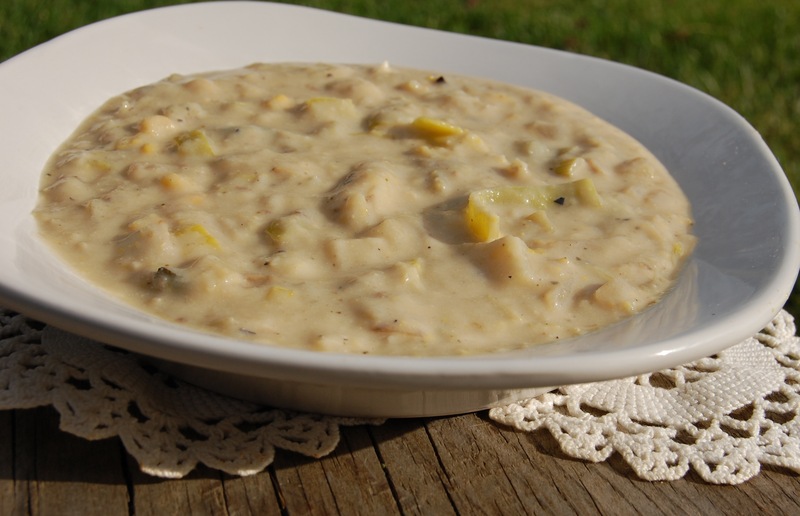 He also loves spice and so our our potato leek soup is usually spicy, and influenced by ingredients we’ve come to love from our time in New Mexico: corn, summer squash or zucchini and especially chile. New Mexico Chile is not the tomatoey dish with meat & beans most people commonly refer to as chili, although sometimes it is spelled that way on menus which is really confusing. Chiles are a type of hot pepper, the hatch pepper, roasted into a delicious spicy sauce put onto everything. In the fall in Albuquerque you can smell the roasting chiles everywhere! Green is my favorite but you can also order red, or Christmas. I was so happy to find a jar of New Mexico chile sauce at my local food co-op on the east coast! I modified this recipe from the Ultimate Uncheese Cookbook, by Joann Stepaniak. It has a variety of dairy free “cheese” ideas which can be a good starting platform for cheese-less experiments. Heat oil in a large soup pot. Add zucchini, onion & leek. Cook on medium heat until soft, about 10 minutes. Add vegetable broth, potatoes, corn & chili pepper, and some freshly ground black pepper. Lower heat and simmer for approximately thirty minutes, until the potatoes are fork tender & beginning to break down. Remove from the heat & allow to cool a little. In the meanwhile, grind your cashews bit by bit in the coffee grinder & then add to the food processor. Add nutritional yeast, salt, onion & garlic powder & flour to the food processor. Now, carefully, put four ladles of soup broth into the food processor. The more chunks of things you get, like potatoes, the creamier it will be. Add the almond milk to the food processor & blend until very creamy. Add the food processor mix back into the soup pot. Stir well. Cook & stir over medium heat until thickened. Do not boil. Add more freshly ground black pepper to taste. Omg my bf is absolutely obsessed with this soup but I’m always avoiding it because of the the cream. Love how you used almond milk and cashews to thicken it up. Ill have to make this one for him as a surprise 🙂 thanks! Thanks! Good luck with it & I’d love to hear how it turned out for you. This soup has been my fiance’s favorite since long before he decided to go veg.